“Meet me at the Bucket of Blood.” How often do you get to say that? It’s what I told my wife as part of a prolonged training ride a week before the Death Ride. 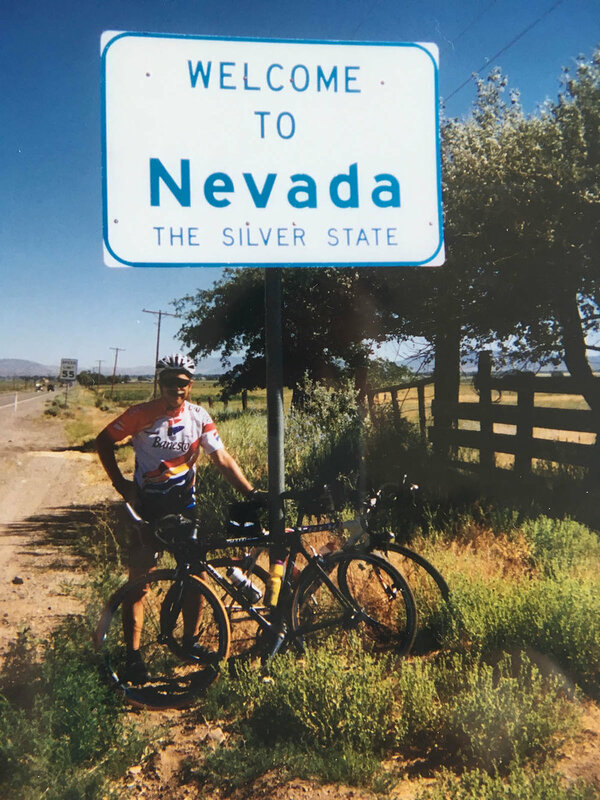 Four days earlier, three of us—Andres, Bill and myself--had left Palo Alto for a four-day road bike journey from southern San Francisco Bay to northern Nevada. Kristen, my wife, drove SAG, ferrying our group’s overnight baggage and our standard poodle, with the end goal being that gory-named Virgina City saloon. On a Friday in early July we crossed the Bay on the Dumbarton Bridge, went up Niles Canyon through the Amador Valley to Old Altamont Pass, which we crested at the Summit Garage, proclaiming “Elevation 761-Ft.” Before I-580, the now dilapidated garage was a prime family vacation stop for soft drinks and ice cream cones en route to the Sierra. Reaching Tracy, we rode under I-205 and took the necessary W. Toleri Rd. bike path to an ancient bridge over the San Joaquin River. Biking through French Camp, we bypassed Stockton for Waterloo, glorious-sounding if you think of the Belgium battle and not Iowa. After a first day of 89 miles, we reached our motel by 2 p.m., plenty of time for an early dinner at the nearby fabulous Waterloo Inn. The next day we headed out for Jack Tone Road, named for a 49er who established a local horse ranch, now reduced in size but still in the family’s ownership. 60 miles away was Volcano, a settlement in a hollow, geologically named incorrectly by the gold miners of the day. We detoured through Dogtown, where we found neither dogs nor town, and turned off at Sutter Creek onto a narrow road with no shoulders snaking through the thick foliage along a creek of the same name. Volcano has a population of just over 100, but on this hot Saturday we caught the Cannonball Run, a 4th of July classic car show, with thankfully all drivers and gawkers having arrived and off the road. The town was packed and we had to split our rooms between the Union Inn and the St. George Hotel, the latter built in 1862. As dragons breathe fire, the name of the dragon-slaying saint was chosen for protection against that era’s scourge of wooden buildings, obviously successful. Sunday was another 60-mile day but with a huge elevation gain, beginning at just over 2000-feet and peaking at 8500-feet on our way to Carson Pass. Initially bypassing Highway 88, we took Rams Horn Grade to Daffodil Hill, then Shake Ridge Road, connecting with the route later chosen for Stage 5 of the 2016 Amgen Tour of California. We intersected with Hwy 88 just below Cook’s Station, where the highway dips past Silver Lake and bends around the Carson Spur en route to Kirkwood. Andres and I, along with Kristen, halted for lunch at the Kirkwood Inn, waiting for Bill, lagging. As happens when bikers get separated, Bill, being told Kirkwood was the stop, took the turnoff to the ski resort, which he found deserted to his dismay. After the unwanted detour, he returned to the highway and came upon us, patiently waiting only 3/10 of a mile down the road. After our meal, we rode past dark-blue Caples Lake and up to the pass, noticing the empty asphalt lot where Death Ride 5-pass pins are annually awarded. The wildly fast descent finally leveled past Pickett’s Junction, where Highway 89 turns north to Stateline, as did the 2016 Amgen Tour route. We glided into Hope Valley’s Sorensen’s Resort, arriving at mid-afternoon, 8 ½ hours after leaving Volcano. As pre-arranged, Andres was met by his wife and her sister, coming back from Reno. He left with them, headed to home in the Bay Area for her birthday celebration: real life interfacing with biking adventure. We meanwhile overnighted in two of the resort’s rustic cabins. Monday morning after a mountain-air breakfast, Bill and I took off, entering the narrow river canyon, knowing every sharp downhill curve until the breakout at Woodfords where we passed by the right-hand Highway 89 turn south toward Markleeville and Turtle Rock Park, where the Death Ride finishes. We enjoyed a glorious, wide-open downhill on Hwy 88 into the Silver State. With a long straightaway ahead, we exited to explore Genoa, pronounced Gen-KNOW-a instead of GEN-oh-wa, and the resting place of that indomitable postman, Snowshoe Thompson. Connecting once more with Highway 395, we spotted the silver-topped capitol building in Carson City, elevation 4,700-feet. After a stop to admire the edifice and check our map, we got onto Highway 50 eastward toward our saloon rendezvous with my wife and poodle. Highway 50 in Nevada is known as The Loneliest Road in America, not so for our short stretch before we reached our Virginia City turnoff to the north. At Silver City, the road forks and we veered left past an old mine and into a stark canyon called Devils Gate. Few cars were on the steeply uphill road while to our left was an old time train engine belching black-smoke as it chugged on a low ridge parallel to us. Struggling uphill into Gold Hill, we spotted the railroad tracks across the steep road ahead. Desperately not wanting to be cut off by the locomotive’s imminent crossing and already overheated, we both stood in the pedals. The train however then stopped for passengers. No bells, no gates and we were free to press on unimpeded. We crested in 3½ miles at 6,300-feet and descended into boiling-hot Virgina City, busy with tourists along its main street that resembles Westworld on steroids. Sure enough, Kristen was waiting at the Bucket of Blood saloon, along with our poodle, panting in what little shade they had found. Less than a football field distance away from the Bucket of Blood establishment is the Mark Twain Saloon and Casino where his honor presided over the Monumental Liars Club. Twain was in Virginia City briefly in the early 1860s, long enough to get into all sorts of trouble, before moving on to San Francisco and eventually to Connecticut. Bill and I had several choices of a return route, including continuing north on Geiger Grade Rd., which would have left us a few miles south of the outskirts of Reno. From there we could have continued southward back to Carson City to soar (pun intended, sorry) over a 8,911-foot summit on the Mt. Rose Highway to the shores of Lake Tahoe at Incline Village. As it were, we chose the other option, which was to leave the melting pavement for our car’s air-conditioning with my wife driving to our weeklong accommodations in Minden. We booked into our motel, done for any serious mileage for the rest of week, resting up and acclimatizing for the upcoming Saturday’s Death Ride. The next day we were joined by Andres, arriving by his car to Douglas County following his wife’s birthday party, just in time for dinner in adjacent Gardnerville at J. T. Basque Bar restaurant, with a menu of northern Spain near Andres’s native state of Asturias. Bolstered by our days biking from the Bay to the Sierra plus some midweek hearty meals, the three of us completed all five passes once again. With my Death Rides over and done with—how many times have I told myself that?—I look forward to returning to the Carson Valley to challenge Daggett Pass out of Genoa and the Mt. Rose Highway out of south Reno, but also to bike through Gold Hill into Virginia City once more, this time for some serious exploring, including some hillside back streets, far from dead level.